When life hands you lemons, make lemonade. Well, life (or in this case, my mother-in-law) didn't hand me lemons, but three bags of carrots last week. What's a girl to do? I could make carrot & pineapple juice, but sadly I'm sorely lacking a juicer. Any juicer manufacturer out there wanting to take pity on a destitute blogger? Carrot salad was also an option (and a firm favourite of TheHusband), but a) it seemed so ... meh and b) I'd then have to make something else to round out the meal. Did I feel like making multiple dishes on Sunday evening? No. And it probably goes without saying that I wasn't in a "meh" mood. 1. Heat the oil in a large saucepan and briefly fry the onion and spices until onion starts to look translucent. 2. Add carrots, cook briefly, then water and bring to the boil. Turn heat down, cover with lid and allow to simmer until carrots are tender. (approx 20 - 30 minutes). 3. Using a stick blender, puree soup till smooth, then add the milk, salt and sugar. Stir and re-heat, then serve, drizzled with cream. This looks fabulous! I often have too many carrots on my hands, and I like the spicy twist. Will give this go, thanks for the recipe! Is anyone ever really in a meh mood? Doubtful. But this soup is anything but. Great use for the carrots! I have made wonderful low fat carrot soup, which I used when I was trying to loose some stubborn pounds - also spiced it up with cumin and masala - but had to leave out the coconut milk. Now that I am no longer loosing pounds, I'll definitely give this a try. Thank you and lovely to meet you too... and now to find your gorgeous, fresh and happy blog :) !! 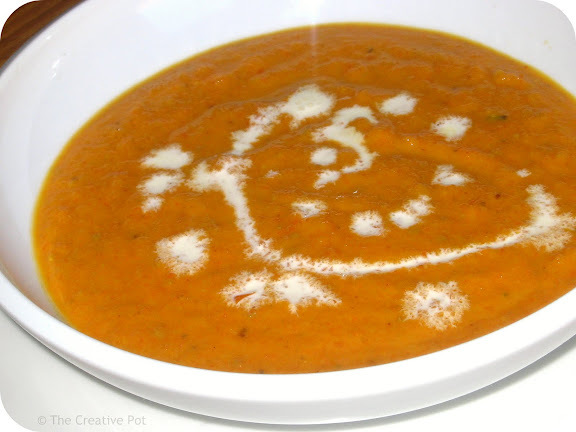 I often make an Indian lentil soup but have never thought about making it on carrots. Will save this recipe for the next time. Oh, and go buy yourself that juice machine, you're not going to regret it!